Eliza Naumann, a seemingly unremarkable nine-year-old, expects never to fit into her gifted family: her autodidact father, Saul, absorbed in his study of Jewish mysticism; her brother, Aaron, the vessel of his father's spiritual ambitions; and her brilliant but distant lawyer-mom, Miriam. But when Eliza sweeps her school and district spelling bees in quick succession, Saul takes it as a sign that she is destined for greatness. In this altered reality, Saul inducts her into his hallowed study and lavishes upon her the attention previously reserved for Aaron, who in his displacement embarks upon a lone quest for spiritual fulfillment. When Miriam's secret life triggers a familial explosion, it is Eliza who must order the chaos.Myla Goldberg's keen eye for detail brings Eliza's journey to three-dimensional life. As she rises from classroom obscurity to the blinding lights and outsized expectations of the National Bee, Eliza's small pains and large joys are finely wrought and deeply felt.Not merely a coming-of-age story, Goldberg's first novel delicately examines the unraveling fabric of one family. The outcome of this tale is as startling and unconventional as her prose, which wields its metaphors sharply and rings with maturity. 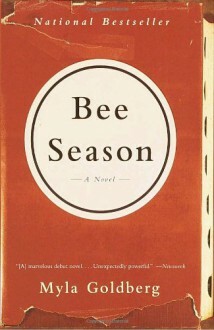 The work of a lyrical and gifted storyteller, Bee Season marks the arrival of an extraordinarily talented new writer. One of the best omnipresent 3rd person narrators I have read in quite some time and the most compelling story I have read about a dysfunctional family since THE ICE STORM. There's a lot more here than just the story of a spelling bee champion. It's a quick read which I highly recommend.